Sports fans will just love a holiday package staying at Disney's All-Star Sports Resort Florida, celebrating great American sporting traditions such as Baseball, American Football, Basketball and Tennis. 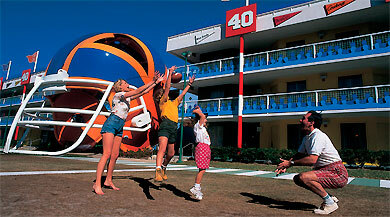 The resort features towering sporting characters and giant baseball bats, footballs and basketball nets. 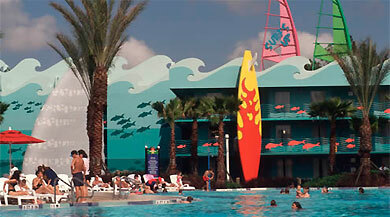 The Disney All-Star Sports Resort boast two amazing pools- The Surfboard Bay Pool and The Grand Slam pool. 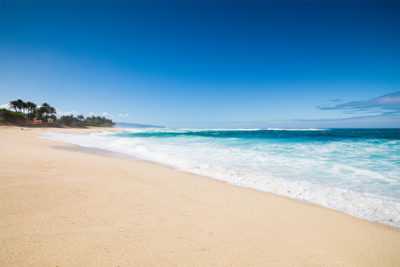 Surfboard Bay is like being at the beach. This pool is massive and is lined with 3-story surfboards-can you hear the ocean? 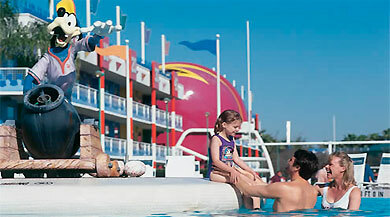 Here, Disney movies are shown pool-side, a nice wind-down after a long day at the parks. 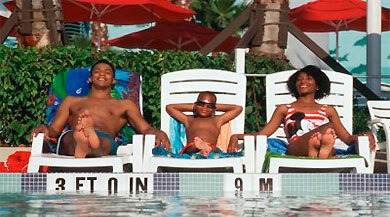 Or, relax on one of the surf board lounge chairs while the kids enjoy the pool party. 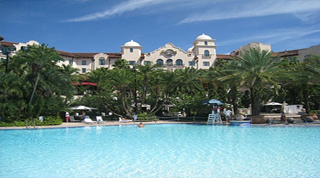 The Grand Slam Pool is made with baseball-lovers in mind. From the huge baseball bats surrounding the diamond-shaped pool , to Goofy on the pitchers mound this pool is made for the love of the gameand for fun of all ages as Goofy tosses water at the players in the pool! There are so many different room choices, visitors can pick their preference- stay in Hoops section which is away from the pool and less noisy. Or choose the Baseball rooms or Surf rooms for convenient access to everything. Preferred rooms will come at a higher price, but will include the perks of shorter walks to the food court and other areas. Toss around the ball on the football field while waiting for the others to get ready. 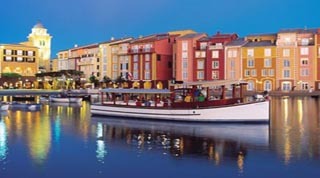 Go and enjoy the nearby ESPN Wide World of Sports. Or head off to the Disney parks. The shuttle service for the all-star resorts picks up at All-Star Sports first and drops off first, perfect for getting a great seat! 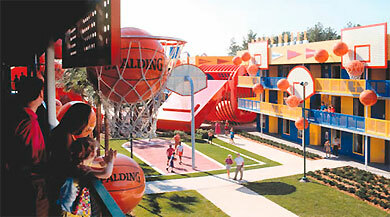 With a hotel parking pass, visitors are allowed to park in the theme parks- saving the fees of parking! Or just take the comfortable, air-conditioned buses that run frequently. All parks are less than 10 minutes away! When sports fans get hungry after a long, fun-filled day at the parks, they can enjoy the End Zone Food Court. Make a custom hamburger, enjoy a pizza with everything, or have some nachos- everything sports fans like after a great game. 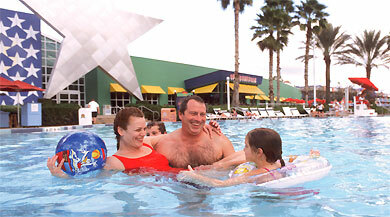 Adults can unwind with a cold draft beer at the Grandstand Spirits Pool Bar. This resort is perfect for those coming in for sporting events, cheerleading competitions and sports-themed celebrations. The resort definitely has the sports spirit going on, from the giant helmets to the baseball, basketball, football, tennis and surfing themes. 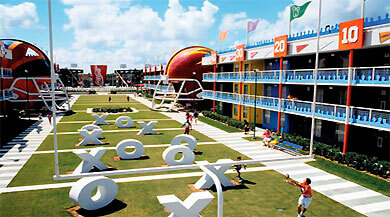 The All-Star Sports Resort offers a gift shop, an arcade and open playing areas, including the football field. 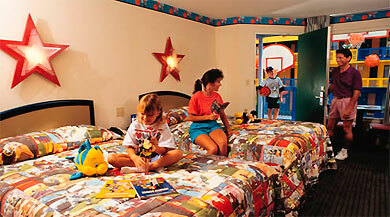 Children can run off all the energy from the Disney sweets before they go to bed for the night. Adults can jog around the 1-mile track that surrounds the resort or throw a football and relax after a long day with the kids.